Earlier in the month my sister-in-law invited me to a Thirty-One party she was hostessing. I never heard of Thirty-One before and was interested in seeing what they had to offer, but I was unable to attend due to a prior commitment. Regardless, I asked to see a catalog. Well, goodness! I was hooked from the first page! Shortly after, I contacted a woman named Jenny Hillenburg, a Senior Executive Director with Thirty-One, and expressed my interested in working with her on a product review. Immediately, I was impressed with Jenny. Not only did she respond to my email quickly, she took the time to choose the right products for me to review. 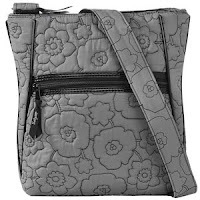 After some deliberation back and forth, we settled on an Organizing Shoulder Bag in Gray Quilted Poppy and an Organizing Utility Tote in Paparazzi Pop. The Organizing Utility Tote arrived first. Right away, I could imagine all the incredible uses for this product! 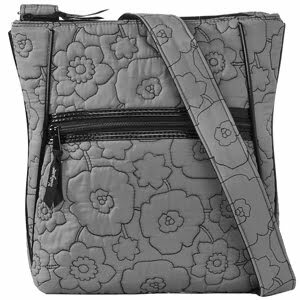 It has five exterior pockets and two mesh side pockets. This bag is perfect for me to use as my teacher bag! My son is eyeing up the bag for use as an overnight bag when he visits Grammy. If my boys were younger, I would definitely use this bag as a diaper bag. 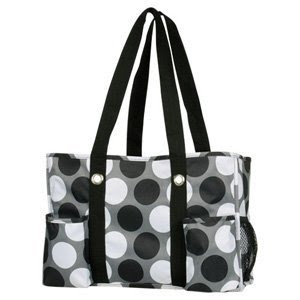 With all the pockets and the very generously sized interior, this bag has many possible uses! The retail cost of this great tote is only $25. You can get it personalized too for an extra $7. When the Organizing Shoulder Bag arrived, I was just a wee bit concerned it would be too small for me as I simply love a large handbag. I was silly to be worried. This bag is roomier than it appears. I love all the pockets (one exterior front zipper pocket, a flat back pocket, two interior flat pockets, and an interior zipper pocket!). My favorite feature of this bag is the adjustable shoulder strap. This handbag is perfect to wear everyday. I am excited to try it out while on vacation this summer and when we go to the amusement park as well. The retail cost of this purse is only $42, and it too can be personalized for an additional $7. Both products I received are well-constructed, functional, and stylish. I look forward to trying other Thirty-One products as well. I wouldn't hesitate to work with Jenny Hillenburg again,. If you are interested in learning more about Thirty-One or want to purchase some of the amazing products for yourself, please visit Jenny's website. You will not be disappointed!